Glamping really comes into its own during this sunny weather. The sun is shining and we’re enjoying the longest spell of hot weather that I can remember. Yurt camping in the UK now feels akin to a holiday in Spain. Our recent guests have been soaking up the sun rays on the farm and making the most of BBQ season. Our hot tub has even been used as a ‘cold tub’. 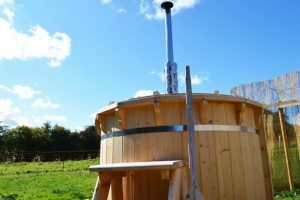 There are a few things that will help you to make the most of glamping in the summer, read on to find out what they are. We think there is nothing better than a funky holiday with friends in the countryside. Canvas tents have (obviously) always been our favourite type of glamping accommodation when going away. We love the closeness to nature; the sun coming in, the sounds of birds, and the gentle drum of rain of the roof. It’s worth knowing how the summer effects the environment inside a tent when packing for your glamping break. On a hot sunny day, yurts and other tents will get rather hot inside. They let the light in, and therefore the heat. To spend time inside a tent in the heat you will need a fan and cool clothing. We have fans that plug into the solar panel hub, but a hand-held fan would also be useful. Battery or wind-up fans are great. At night, even in summer, the temperature drops by at least 10 degrees. Warm sleep-wear is essential for those prone to getting cold. Even a cosy blanket on top of the duvet would not go amiss. Remember though, as soon as the sun comes back up (about 4.30 am), it will soon get hot, so you’ll want to throw off the covers or take off a few layers. With the beautiful weather we are having, it’s unlikely you’ll end up staying inside your yurt anyway. I don’t want to sound like a nagging parent BUT when you venture out of your yurt and explore the sunny scenery, sun cream is a must. I feel we often underestimate the strength of the UK sun. One of the joys of glamping is the amount of time spent outdoors. It’s why so many of us choose this type of holiday. Because of this, its even more important to come prepared with a bottle, or two, of sun cream. Protective nagging over. Keeping cool when outside is the next challenge when yurt camping in summer. Keeping hydrated is key to this. A nice cold drink does the trick nicely. Fridge space can often be limited when glamping so this ice bucket hack can make life easier. Bring a few bags of ice with you to the glamping site and empty them into a big bucket. Store your drinks in the ice bucket and they’ll stay wonderfully cold. Keep the bucket in the shade if you can to prolong the ice. This way you can keep the fridge space for all the food and have the ice-cold drinks within reaching distance of your sunbathing spot. My final summer yurt camping tip is to always bring a picnic blanket with you. And to take it with you when you go exploring. Picnic blankets are the ultimate portable seating area. They are so easy to carry and can be put down anywhere. Sounds obvious, I know. With a few pillows from your tent, you can make a cosy sunny lounge area. When you go for a walk, take the blanket with you and you can stop for a break anywhere. Bring along your lunch for the whole picnic experience. Just imagine ambling through a shaded woodland and finding a sunny glade for a picnic. 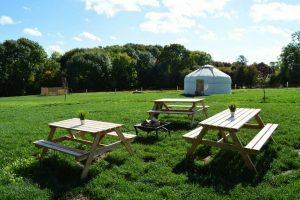 Yurt camping in the UK when we have such wonderful sun is a great experience. 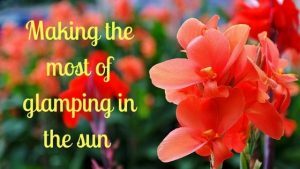 Make the most of it before our weather changes again. If you remember a few specific things when you’re packing for your glamping break, you will feel even better prepared. Bring a hand-held fan, cool clothes for the day, warm PJ’s, sun cream, an ice bucket, and a picnic blanket – you’ll be set. Fancy a spontaneous summer glamping break? We have mid-week availability for you. Have a look at the dates on our availability calendar here. 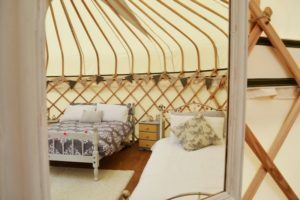 We can offer 1-night stays during the week at short notice, send an email to bookings@countrybumpkinyurts.co.uk to inquire. We’d love to welcome you to your sunny yurt escape. ← Alternative hen parties: a round up of some of the wonderful hen do activities at Country Bumpkin Yurts.